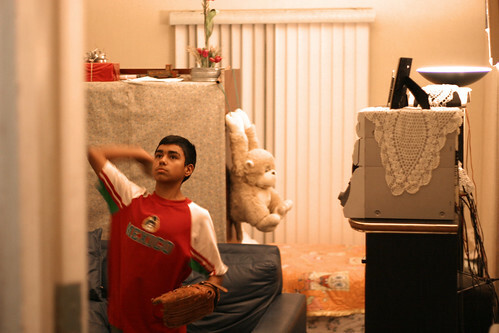 Benjamin is 12 years old and lives with his father and grandmother in Tijuana. His mother died when he was two. He knows her mostly from pictures. His father moved them to California a few years after; Benjamin went to school and learned to speak English. After several hard years working multiple kitchen jobs, they returned to Guadalajara. Some years later, they came back to Tijuana to live on the same street they lived together as a young family almost 10 years earlier. My wife Rosario had told me about her sister and the child she left behind. And I met my new nephew less than a year before becoming his uncle. “La tiramos afuera, tio?” “Sure,” I say following him outside to play catch at 9 o’clock at night. The brisk air becomes more and more bearable as I warm up, throwing fast and fly balls, sprinting to chase the green grounders that get by. Between breaks for passing cars, Benjamin’s cousin, Roberto (another nephew I neglected to mention who lives in California but had to come back and enroll in school to renew his visa), comes outside to join the game. Benjamin scoops up a broken two by four, hands it to Roberto and takes the mound. I pull a chunk of particleboard out of the neighbor’s construction scrap and place it at home plate. The rules quickly come together, hits and runs measured by speed bumps and telephone poles. In this moment, Tijuana blooms. Streetlights become stadium floodlights and the uneven pavement becomes a world-class ballpark. The moment never lasts long enough. I didn’t hit the hero’s home run I had hoped for. But it doesn’t matter to them. Who says you need a baseball or a bat to play baseball. They can turn the contents of your pocket into ninja stars. And they have no idea how much they inspire me. Beautifully told, Nathan. And the photo is perfect. This is so very moving. I was right there with you playing ball in the street. Great writing Nate, beautiful imagery! Por eso me gustan las calles en México, son los mejores estadios y se juegan los mejores partidos.